UPDATE3: There is now a tool to check whether AMT is enabled and provisioned on Linux systems. UPDATE2: It gets worse. Much worse. If your Windows laptop runs #IntelAMT, and you enable #WiFi for AMT and you connect to public WiFi AMT is accessible to anyone on that network. 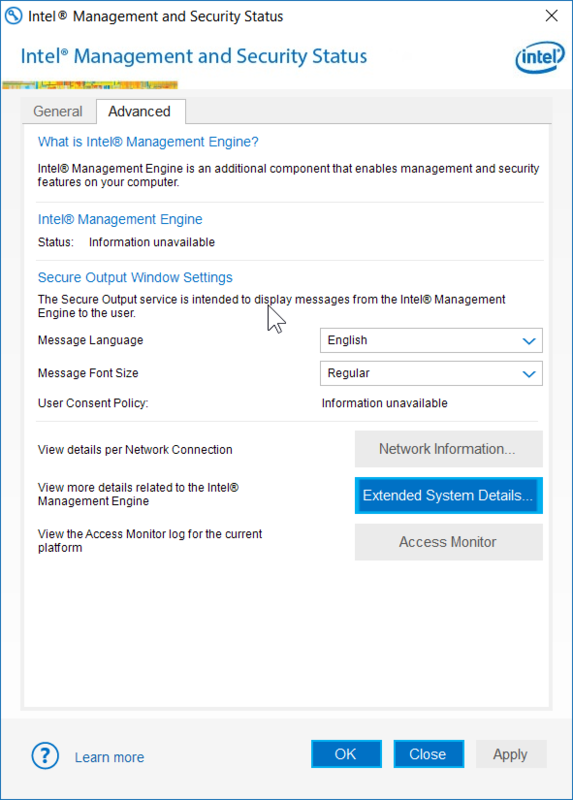 Completely and permanently (unless you re-install it) disable Intel Active Management Technology, Intel Small Business Technology, and Intel Standard Manageability on Windows. These are components of the Intel Management Engine firmware. This is especially relevant since a privilege escalation issue affecting Intel ME (CVE-2017-5689) was made public on May 1st. A patch for Linux is forthcoming. This vulnerability was discovered by Embedi. also run `sc qc LMS`, which will either show you the path to LMS.exe or FAIL. If it shows you the path, use Explorer to delete it. If it FAILED, do not be concerned. 8) Optionally, you can now delete LMS.exe. It is usually located in “C:\Program Files (x86)\Intel\Intel(R) Management Engine Components\LMS”. You could go further and use Add/Remove Programs to uninstall the AMT GUI, but then you will have a harder time in the future checking whether Intel AMT remains disabled. Voilá, you have gotten rid of the Intel AMT components. But the Intel ME co-processor is still running. Disabling the Intel Management Engine chip has long been a desired goal. If you can point to resources on disabling the Intel ME co-processor for chipsets Haswell and after, please comment below. If your computer has a chipset earlier than Haswell, you can try, at your own risk, these steps. Eddie Barcellos – AMD doesn’t use Intel ME. All AMD CPUs after FX have PSP, which is pretty much the same thing as Intel ME. It also can’t be removed/disabled. @Eddie Barcellos – the difference is that AMD’s is open source. From my understanding you can bypass AMT authentication for default admin account or any other known account name. This can be easy mitigate if you rename default admin account to any random name, this was the first thing I did few years ago after I set up the AMT. @ecfx, that is good advice but it is not good protection. we don’t even know for sure if the vulnerability requires logging into AMT. @Ronald, https://software.intel.com/en-us/documentation/amt-reference/manageability-ports does not list said ports? 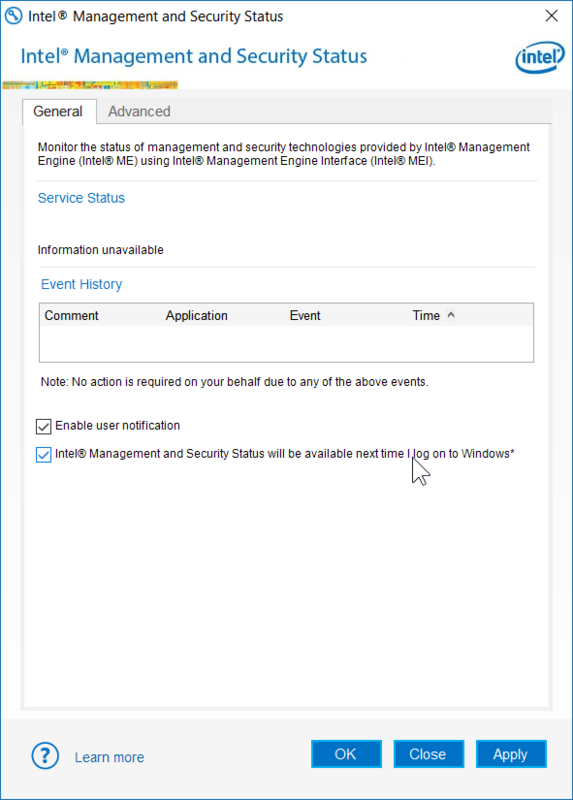 Does it help at all to disable Intel AMT in group policy? Sign up for our newsletter feed and be kept up to date. Website by MATTERmedia licensed under Attribution-NonCommercial-NoDerivs 2.5 Generic (CC BY-NC-ND 2.5).